Get an updated Trend analysis for KMP and EEP. Some investors lack the patience to buy a stock, hold it for one year and then receive a 3%- 5% dividend by the end of the year. They believe that in the stock market one could easily make 3%-5% every day by trading volatile stocks such as US Bancorp (USB), Citigroup (C ), Bank of America (BAC) instead. Such comments assume that investors have a strategy where they could consistently buy low and sell high for a large profit. Based off numerous studies of individual investors, mutual funds and active managers in general, it seems that over 85% of active traders not only under perform the S&P 500, but also lose a significant amount of money in the process. Substituting investing in the stock market for gambling at Las Vegas is often a get poor quick strategy. This could lead to complete denial of stock market investing as a whole, and failing to reach one’s financial goals. If you bought a diversified portfolio of at least 30 income-producing stocks from different sectors, chances are your returns would be somewhat closer to the market. Chances are that you won’t have picked all 30 of the next WorldCom, Enron or AIG. Thus in order for you to lose all of your principal and dividend income with a buy and hold strategy would be pretty impossible to do. If you however try to buy and sell stocks every day in order to capture huge potential profits, the probability of you compounding your losses faster and faster until you run out of money is very large. If you thought forecasting day-to-day fluctuations in the stock market are hard to predict, then try predicting the annual changes in the stock market averages. We are all being told that on average the stock market goes up by 10% every year. It is true that over the past century the S&P 500 and the Dow Industrials have achieved a total return of somewhat close to 10% on average per year over large periods of time. 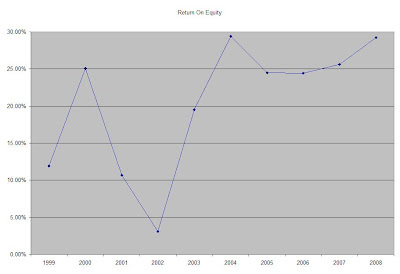 Annual total returns are the sum of annual price appreciation and the yearly dividend yield. When stock markets are booming, investors tend to forget that stocks represent right to ownership of real companies, and instead treat them like lottery tickets. During bull markets all investors care about is finding a greater fool to bid their stocks higher, while completely ignoring fundamentals. 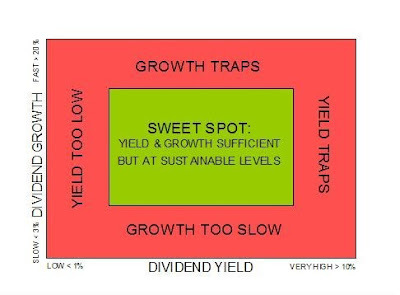 During bear markets however investors get timely reassurance from their stocks in the form of dividends, which lower investment losses. While capital gains could quickly evaporate and turn into losses, dividends are real cash that is deposited to your brokerage account. Investors could then decide how they plan to allocate it best for their individual needs. While it is difficult to predict stock prices due to their volatility, until recently dividends have been much less volatile, and thus easier to rely on in both good and bad times. This makes dividends particularly beneficial for individuals who are planning to retire and live off their dividends. Reinvested dividends magnify total returns and deliver even faster compounding of dividend income. Reinvested dividends are believed to have accounted for 97% of S&P 500 total returns since 1871. Another important characteristic of dividends is that they could grow over time. Dividend Growth has exceeded inflation by 2% annually over the past 85 years. While the quarterly dividend per share in the S&P 500 was $1.05 in early 1977, it has risen to over $7 by 2008. Coca Cola (KO), which manufactures, distributes, and markets nonalcoholic beverage concentrates and syrups worldwide has rewarded its shareholders with regular dividend increases for 47 consecutive years. Dividends have increased by an average of 9.00% annually since 1999. The stock currently yields 3.60%. Check Brad's analysis of Coca Cola (KO). Wal-Mart Stores (WMT), which operates the largest chain of retail stores in various formats worldwide, has boosted dividends for 35 consecutive years. Dividend payments have increased by an average of 16.50% annually over the past ten years. The company currently yields 2.30%. Check my analysis of Wal-Mart Stores (WMT). Exxon Mobil Corporation (XOM), which engages in the exploration, production, transportation, and sale of crude oil and natural gas, has rewarded shareholders with a dividend raise for 27 consecutive years. Dividends have increased by an average of 7% annually since 1999. This oil company currently yields 2.40% . Check my recent analysis of Exxon Mobil (XOM). Abbott Laboratories (ABT), which manufactures and sells health care products worldwide, has raised dividends for 37 consecutive years. Annual dividends have increased by an average of 8.80% annually over the past decade. The stock currently yields 3.70%. Check my analysis of Abbott Laboratories (ABT). AT&T (T), which provides communication services in the USA and internationally, has increased its dividends for 25 consecutive years. Annual dividend payments have increased by an average of 5.70% annually since 1999. The stock currently yields 6.60%. Check my analysis of AT&T (T). By creating a diversified income portfolio through dollar cost averaging and by reinvesting dividends, investors are more likely than not to achieve long-term sustainable success in the market. NACCO Industries, Inc. (NC), which engages in lift trucks, housewares, and mining businesses, increased its regular cash dividend from 51.5 cents to 51.75 cents per share. NACCO Industries, Inc. is a dividend achiever, which has rewarded its shareholders with an uninterrupted streak of increased dividends for 25 consecutive years. The stock currently yields 6.40%. National Grid (NGG), which engages in the ownership and operation of regulated electricity and gas infrastructure networks, raised its final dividend to 0.23 GBP per share. ADR holders are expected to receive a dividend payment of $1.74 for the second half of 2009. National Grid is an international dividend achiever, which has rewarded its shareholders with an uninterrupted streak of increased dividends for 12 consecutive years. The stock currently yields 6.10%. Assurant, Inc. (AIZ), which provides specialized insurance products and related services in North America and internationally, raised its quarterly dividend by 7% to $0.15 per share. Assurant, Inc has rewarded its shareholders with an uninterrupted streak of increased dividends since 2004. Molson Coors Brewing Company (TAP), which brews, markets, sells, and distributes beer and other beverages, raised its quarterly dividend by 20% to $0.24 per share. This is the second consecutive dividend increase for Molson Coors Brewing Company since 2008. The stock currently yields 2.30%. The CEO of the company showed his confidence in the company’s ability to generate strong cashflows with this statement: "We are in a strong position to increase cash returns to shareholders, while preserving the financial flexibility to explore growth opportunities that meet our strict return criteria." Portland General Electric Company (POR), which engages in the generation, purchase, transmission, distribution, and retail sale of electricity in the state of Oregon, declared a 4% increase in its quarterly dividend to $0.255 per share. This represents the third consecutive dividend increase for Portland General Electric Company since the company went public in 2006. The stock currently yields 5.90%. Communications Systems, Inc. (JCS), which manufactures and sells modular connecting and wiring devices, and media and rate conversion products, announced that its Board has approved a 16.6% increase in its quarterly dividend from $0.12 to $0.14 per. Communications Systems, Inc. has rewarded its shareholders with an uninterrupted streak of increased dividends since 2003. The stock currently yields 6.20%. AmTrust Financial Services, Inc. (AFSI), which operates as a specialty property and casualty insurance company, raised its quarterly dividend by 20% to $0.06 per share. This represents the fourth consecutive dividend increase for AmTrust Financial Services, Inc since the company went public in 2006 The stock currently yields 2.10%. FactSet Research Systems Inc (FDS), which provides financial and economic information, including fundamental financial data on various companies to the investment community worldwide, boosted its quarterly dividend by 11% to $0.20per share. FactSet Research Systems Inc has rewarded its shareholders with an uninterrupted streak of increased dividends since 1999. The stock currently yields 1.40%. As a dividend investor, it pays to scan the wires for news of dividend increases even in the current credit crisis. This exercise could uncover strong dividend players for further analysis and inclusion in ones portfolio. The long awaited disclosure from Berkshire Hathaway about its holdings is online. This time however many are doubting Buffett’s wisdom after his stock lost over 32% of its value in 2008 versus S&P 500's 36.7% loss. He also made some derivative bets on indexes which are misunderstood by most market participants. Year to date Berkshire Hathaway stock is down 7.75%, and is trailing the S&P500’s year to date gain of 2.43% by a wide margin. Over the past 30 years however, Berkshire Hathaway has significantly outperformed the S&P 500. There were changes in ten positions owned by Berkshire Hathaway. The companies where Berkshire added to positions included Burlington Northern Santa Fe (BNI), Wells Fargo (WFC), US Bancorp (USB), Nalco (NLC), Johnson & Johnson (JNJ) and Union Pacific Corp (UNP). His addition to positions in Wells Fargo and US Bancorp seem to have been made at particularly challenging conditions near the 52-week lows for both stocks. Once again Buffett seems to have followed his strategy of being greedy when others are being fearful, by loading up on the above stocks. 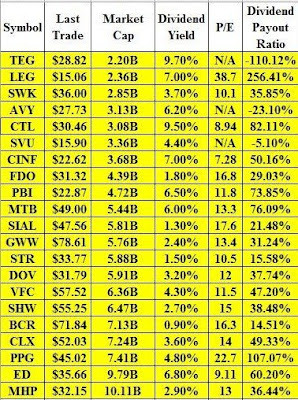 Another interesting trend is that Buffett keeps adding to his positions in railway stocks, especially Burlington Northern. The purchase of additional Johnson & Johnson is a bullish sign as well. Berkshire sold over 33 million JNJ shares back in the fourth quarter of 2008 in order to generate enough cash to participate in the preferred stock offerings of several companies including General Electric (GE) and Goldman Sachs (GS). The companies where Berkshire trimmed positions include Carmax (KMX), Constellation Energy Group (CEG), ConocoPhilips (COP) and United Health Group (UNH). The number of Conoco shares that Berkshire owns is most probably lower than what the filing shows. The same is true for Berkshire’s position in Constellation Energy (CEG) as well. Does is pay to follow Buffett’s moves? The answer is yes it does. According to this paper a portfolio that mimicked Buffet’s stock investments would have outperformed S&P 500 by 14.6% annually between 1976 and 2006. 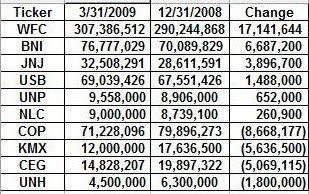 Here's a list of Berkshire Hathaway holdings as of March 31, 2009. This business model would make most investors head for the exits at economic times like these. For investors who look to buy businesses rather than stocks, however, this company still hassome value. And it is precisely because most investors headed for the exits that value investors were able to buy into this company for far less than it is worth. When we last looked at LCAV, it traded with a market cap of $64 million, despite the fact that it had $56 million in cash alone! When looked at from the point of view of a buyer of an entire business (as value investors like to do), one was essentially paying $8 million to purchase a business that had earned an average of $15 million in net income the last four years. Yes, it had lost $7 million in the last quarter, but management was closing unprofitable locations, reducing capital expenditures, and believed to have cut expenses such that the company's cash flow would break even in 2009. Since the stock's low just two months ago, the stock is up some 250%! Investors who avoided the herd mentality, and instead focused on buying businesses selling for below their worth were handsomely rewarded. At Barel Karsan , we try to find and discuss businesses that are undervalued. If this topic interests you, consider subscribing to the Barel Karsan feed . 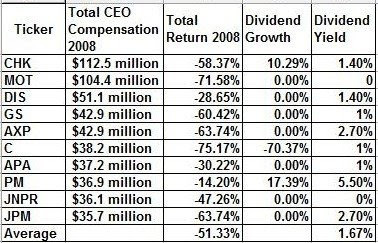 The dividend aristocrats universe is shrinking according to analysts as some companies freeze dividends while others cut their payments. S&P might even consider lowering the standards for the elite dividend index. One of the criteria that could be lowered is the requirement for annual dividend increases to 20 years or fewer. This is in response to the fact that the number of aristocrats has decreased from 64 in 2001 to potentially less than 40 by year-end. The stocks that come to mind as solid candidates for the Dividend Aristocrats index is AT&T (T) and Brown Forman (BF-B). AT&T has increased its dividends for 25 consecutive years and is a member of the S&P 500. AT&T last raised its quarterly dividends in December 2008 by 2.5% to $0.41/share. The stock currently yields 6.40%. Check my analysis of AT&T. Brown Forman (BF-B) has increased its dividends for 25 consecutive years as well. The company engages in the manufacture, bottling, import, export, and marketing of alcoholic beverage brands. Some of its well-known brands include Jack Daniel's, Finlandia, and Southern Comfort. The stock currently yields 2.60%. Cintas Corp (CTAS), which provides corporate identity uniforms and related business services in the United States and Canada, has increased its dividends for over 22 consecutive years. The Cincinnati, Ohio based company currently yields 1.80%. Health Care Property Investors Inc (HCP), operates as a real estate investment trust in the United States. HCP has an uninterrupted record of increasing distribution for 23 consecutive years. The REIT currently yields 9.30%. McCormick & Company (MKC), which engages in the manufacture, marketing, and distribution of flavor products and other specialty food products to the food industry worldwide, has rewarded shareholders with consistent dividend increases for 22 consecutive years. The stock currently yields 3.30%. Northern Trust (NTRS) has increased dividends for 22 consecutive years. The provider of banking and financial services to large and mid-sized corporations and financial institutions currently yields 2.10%. T. Rowe Price Group, Inc. (TROW) which provides investment management services to corporations, corporate, public, and Taft-Hartley retirement plans, foundations, and endowments has increased payouts for 22 consecutive years. This financial company currently yields 2.70%. Chevron Corp (CVX) has consistently increased dividends for 21 years. This integrated energy company worldwide currently yields 4.10%. Check my analysis of Chevron Corp. The Travelers Companies (TRV), which is a provider of various commercial and personal property and casualty insurance products and services to businesses, government units, associations, currently yields 3%. The stock has raised dividends for 21 consecutive years. Progress energy (PGN), which engages in the generation, transmission, distribution, and sale of electricity in North Carolina, South Carolina and Florida has a record of 21 consecutive annual dividend increases. This utility currently yields 7.30%. At the end of the day I agree with the Bloomberg article that “In the end it isn't the number of stocks you own, but owning the right stocks.” If the S&P lowered its criteria for inclusion in the elite dividend index, then this would distort the basket. Last week marked the busiest week for dividend increases in 2009 as several blue chip companies such as IBM, Costco and Exxon Mobil raised their payouts. It is always bullish to see companies which have always rewarded shareholders with raised payouts continue operating in a shareholder friendly pattern of behavior. ExxonMobil (XOM), which engages in the exploration, production, transportation, and sale of crude oil and natural gas, raised its quarterly dividend by 5% to $0.42 per share. Exxon Mobil is a dividend aristocrat, which has rewarded its shareholders with an uninterrupted streak of increased dividends for 27 consecutive years. The stock of the largest energy company in the world currently yields only 2.40%. Check out my analysis of XOM. International Business Machines (IBM), which develops and manufactures information technology products and services worldwide, announced a 10% boost to its quarterly dividend to $0.55 per share. IBM is a dividend achiever, which has rewarded its shareholders with an uninterrupted streak of increased dividends for 14 consecutive years. The stock currently yields only 2.00%. Check out my analysis of IBM. W.W. Grainger, Inc. (GWW), which distributes facilities maintenance and other related products in North America., announced a 10% boost to its quarterly dividend to $0.55 per share. W.W. Grainger, Inc. is a dividend aristocrat, which has rewarded its shareholders with an uninterrupted streak of increased dividends for 38 consecutive years. The stock currently yields only 2.00%. Check out my analysis of GWW. Costco (COST), which operates membership warehouses that offer a selection of branded and private label products in a range of merchandise categories in no-frills, self-service warehouse facilities, announced an increase to its quarterly dividend from $0.16 to $0.18 per share. Costco has rewarded its shareholders with an uninterrupted streak of increased dividends since 2004. The stock currently yields only 1.30%. Occidental Petroleum Corporation (OXY), which operates as an oil and gas exploration and production company, announced an increase to its quarterly dividend from $0.32 to $0.33 per share. Occidental Petroleum Corporation has rewarded its shareholders with an uninterrupted streak of increased dividends since 2003. The stock currently yields only 2.20%. Safeway Inc. (SWY), which operates as a food and drug retailer in North America, announced a 21% boost to its quarterly dividend to $0.10 per share. Safeway Inc. has rewarded its shareholders with an uninterrupted streak of increased dividends since 2005. The stock currently yields only 1.60%.